We are counting down the days until the return of Michael Myers in the new Halloween movie, and Entertainment Weekly is getting in on The Year of The Shape with a badass new cover, photos, and accompanying epic article, but today they unveiled the first official clip from the film! In clip, which is pretty much spoiler-free if you’ve already seen both of the trailers, Laurie Strode sees that Michael Myers is outside the door and tells her daughter, Karen, played by Judy Greer, to go hide. Easily the best part of the clip, however, is hearing incredibly chilling bits of John Carpenter’s newly composed score. Watch the clip below, and then tell us what you think in the comments! 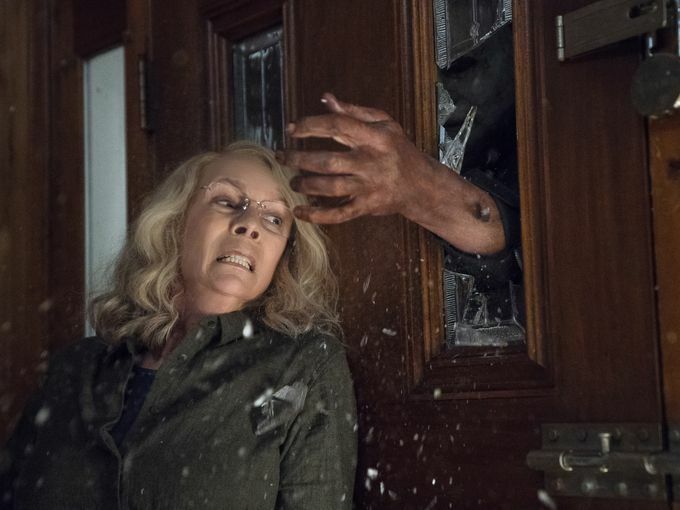 You can watch the first official clip from Halloween below. Michael Myers or “The Shape” and Jamie Lee Curtis photographed exclusively for Entertainment Weekly by Art Streiber on September 17th, 2018 in Los Angeles. Jamie Lee Curtis photographed exclusively for Entertainment Weekly by Art Streiber on September 17th, 2018 in Los Angeles. Michael Myers from the movie, “Halloween”, photographed exclusively for Entertainment Weekly by Art Streiber on September 17th, 2018 in Los Angeles.